Soil pH Kits give one of the most misunderstood and misused measurements in the conventional and organic gardening worlds: pH. It’s a fascinating topic and I’m excited to get into it here. If you can get your head around the information in this article (it may be no problem for you, but it took me a while to get it), you will know more about pH than most gardeners, including most horticultural professionals, teachers and authors. I must admit I now cringe every time I get to the pH test for soil discussion in most gardening books, because there is almost always bad advice. But I remind myself that I had the same beliefs about pH for most of my gardening life before I actually studied it in detail. How Are Soil pH Kits Usually Used And What’s Wrong With It? Here is how a pH test for soil normally goes. You determine the pH of your soil through soil pH kits or by sending a soil sample to a soil testing lab. If it’s “too low” (perhaps below 6 or so), you add lime, usually dolomite lime, to bring it up. If it’s “too high” (perhaps above 7), you add gypsum to bring it down. These are allowed in organic gardening, too. But the soil pH kits don’t tell you how much calcium and magnesium (dolomite) or calcium and sulfur (gypsum) your soil has. You may very well have enough or too much of these things already and still have a pH that isn’t perfect. Adding more just makes things worse. Another problem with your average pH test for soil is that the results you get will change as much as 2 whole points over the course of 24 hours depending on rain and temperature and other variables. Taking them often and keeping track of the time of year and climate conditions when you take them can give hints as to the discrepancies you will find, but still, these discrepancies can be huge. Your soil is made up of sand, silt, and clay. There is also hopefully a small amount of organic matter such as leaves, microorganisms, insects and humus. Humus is organic matter that has been broken down almost as far as it can go, so it looks kind of like soil. Of the sand, silt, clay and humus, only the clay and humus hold onto the elements such as hydrogen, calcium and magnesium. The clay and humus hold them on “exchange sites”. If your soil was only sand and silt, those elements would leach out of your soil very quickly because there is nothing to hold onto them, and you might have perpetually infertile soil. But back to the “exchange sites”. Soil pH kits measure what percentage of your exchange sites are occupied by hydrogen. The more hydrogen, the more “acidic” the soil becomes. Hydrogen and the other elements battle it out for exchange sites, so the more hydrogen there is, the less calcium, magnesium and other nutrients there are. A pH of 1 is the most acidic and 14 is the most “alkaline”, but we don’t get to those extremes in the soil. In fact at a pH of approximately 4, all of the exchange sites are occupied by hydrogen anyway, and most soils don’t get much lower than that (if they do, there are other acids in the soil solution). A pH of 7 is “neutral” and none of the exchange sites are occupied by hydrogen. Instead they are occupied by calcium, magnesium and other minerals. This doesn’t necessarily mean that your soil is totally awesome, because all of the sites could be occupied by just one mineral such as aluminum or calcium. Not very well-rounded nutrition and quite toxic to plants. As an aside, the pH test for soil may go up to 8 or 9 when there are excess carbonates in the soil, such as in areas with low precipitation. But soil pH kits don’t tell you what percentage of your soil is clay. You could have a pH of 7 and think that you must have lots of minerals in there, but if your soil is only 5% clay and organic matter (some of which is humus), both of which hold on to elements, and the rest is sand/silt, which doesn’t hold onto elements, you really don’t have many elements in your soil. Conversely, you could have a pH of 5.5 and think your soil is low in fertility, but if you have 60% clay, you might be doing just fine. Another way of looking at this is we could have two organic gardens in different areas both at a pH of 6, yet these soils may have very different mineral contents because the first soil could be low clay and the second soil could be high clay. So, soil pH kits tell what percentage of your exchange sites are occupied by hydrogen, but they don’t tell you what other elements are there, and they don’t tell you how much clay and humus you have. On Wednesday, I will discuss whether a pH test for soil is ever useful. Please feel free to ask me any questions below. This is a bit of a tricky topic and definitely different than what you will read in most gardening books. Thanks for this. I’ve always done ph testing, but to be honest, I never knew what I was supposed to do with it other than add peat moss, which I now understand is not great. Yes this is a tough subject. Not having a scientific background, I have little knowledge of the elements. My reading has focused on soil life and how to increase it. The first article written by you that I read was about using fallen leaves in the garden. None of this year’s leaves in any of my gardens were discarded this year, because of you. Now I am planning to actually have some soil tests done, not sure yet where or how, but now I know why. One of my customers has a strip in her lawn where a drain line was installed and where the grass fails to thrive. I am convinced a soil test is in order. What are your thoughts about pH and microorganism activity? Also micro-nutrient availabilities? I’ve done two recent pH tests at a one month interval and received two results of 5.3. Working with clay/mineral soil. Without getting into too much detail, both tests have suggested that for growing vegetables, I add well over 1 ton of lime/acre. Anyway, a big reason I’m thinking about liming is to foster a better microorganism environment. I’ve read they do a lot better with pHs of at least 6 (and I’m a little depressed by the apparent lack of activity in the soil currently). I’m also under the impression that a higher pH is important for micro-nutrient availabilities. Do you have any insight on these matters?Thank you for all the work you’ve put into this site. pH definitely influences micronutrient availability and microorganismactivity. The problem is a pH test doesn’t tell you which nutrients you havein your soil, and therefore which nutrients you need to add in order to movethe nutrient ratios in your soil towards balance. When you add the correctnutrients, the pH will move towards neutral. Adding organic matter will dothis, too. 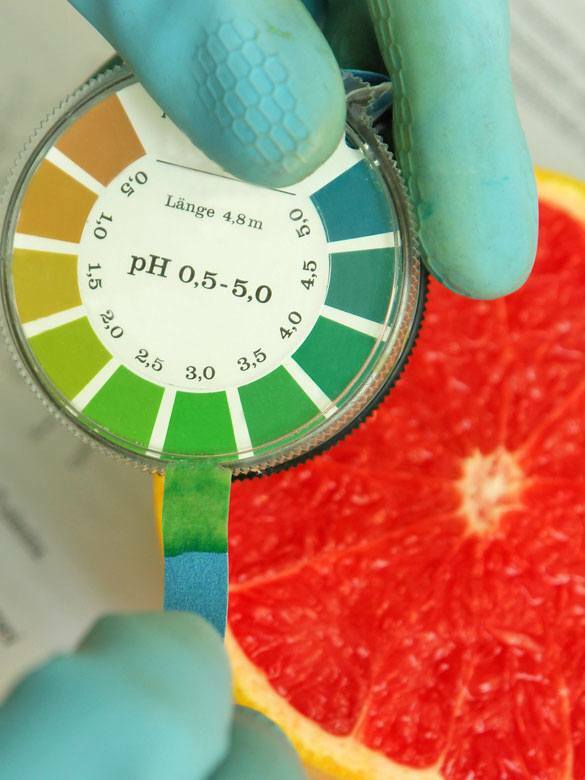 It’s important to do both.But a pH test won’t tell you which kind of lime to add, or if you also needto add materials containing phosphorus, potassium, sulfur and so on. Only asoil test can help with that. I’ll write about all of this in more detail byspring. As an aside, a pH of 5.3 on a clay soil, assuming your test resultsare accurate (which they often aren’t), would not worry me much. But ifyou’re going to add lime, go for calcitic lime (calcium carbonate) insteadof dolomite, and I wouldn’t do more than 1/2 ton/acre without a soil test.In fact, I’d probably do 1/4 ton in spring and fall. But more likely, I’d goget a soil test from International Ag Labs or Crop Services Internationaland then I’d know what I need. Hope this helps. More detail in future blogposts. very interesting post and it makes a lot of sense. I think people are too quick to add something for a quick fix. I have continaully added homemade compost, seaweed, dug in prawn shells etc. Occasionally I stick in one of those little ph meters just because I have it and my soil seem to stay in the 6.5 to 7 range. Most of the gardeners here add lime just as a matter of course, so glad I havnt followed that route. Gardening is supposed to be a low stress activity and I think the less we stress the soil the better it is! “Besides, plants seem to tolerate a much wider pH range when there is plenty of organic matter in the soil.”I would reword this (personally) to something like, “Besides, plants seem to grow well in soils of various pH levels given plenty of organic matter. In fact, plants have some ability to adjust the pH in their root zones to their liking, and various pH levels can be found within a single root zone.Hard topic, Phil. I guess one would be left wondering, so how DO I know what to add in the nutrient department? I have seen incredible yield increases in two gardens I work with from amending the soil. And they had excellent soil fertility cycling going on already, and reasonably good yields. When it’s needed it makes a big difference, but where do you draw the line about how much info you are going to attempt to cover in your book, eh? Hi Carol,A thin mulch layer of wood chips on the surface of the soil can encourage fungi, as can a woody compost and a compost tea made with woody compost. Mycorrhizal fungi, which are some of the most important fungi, can also be purchased and applied to the soil. I’ll write about that some day this year. Either I am too stupid to understand my soil science textbooks or you have some bad science in this article. Hi Rook, there are a lot of bad soil science texts out there, but tell me where the discrepancies are and hopefully we can sort it out here. To pick up from the previous commenter, you are treating H+ as if it were a nutrient or important because it competes for exchange sites. This is not why pH is important. Only water or water based solutions have a pH. So it is not your soil that has the pH, it is your soil water that does. Now we all know that water is H2O. In pure water a little bit of this will spontaneously break apart into H+ and OH- ions. Technically, the pH is the negative log of H+ activity. However, to simplify things, we can say it is the negative log of H+ concentration instead. So what does that mean? Well because it is negative that means that if we have a LOW pH we have a HIGH concentration of H+ (and a LOW concentration of OH-). The log bit means that rather than being a normal scale where each number is worth the same as each other, on this scale the concentration is multiplied by 10 for each single pH unit. So a pH of 6 has ten times more H+ (and 10 times less OH-) than a pH of 7, and a pH of 5 has 100 times more H+ (less OH-) than a pH of 7. Okay, but why do we care about H+ (or OH-) concentrations? Well, lots of stuff we put in water (ie. soil) reacts with H+ (or OH-) and the more H+ (or OH-) there is around, the more these reactions are pushed in one direction or the other. In terms of soil there are very many pH dependent reactions but two that are very important are pH dependent exchange sites and the dissolution of aluminium. The exchange sites on metal oxides, organic matter/humus, and on many clays are mostly formed by negatively charged -OH groups. When there are lots of H+ present (ie. low pH) these exchange sites react with the H+ to become positively charged -OHH groups. Negatively charged exchange sites become positively charged exchange sites. This means that as pH falls, CEC falls (and AEC rises). The second thing that happens is that below a pH of 5.5 the clay fraction of the soil literally begins dissolving and releasing aluminium ions. Aluminium ions are 3+ whereas both calcium and magnesium are 2+. This means that at the same time that the number of negatively charged exchange sites is falling aluminium begins competing for those sites and because aluminium has a higher charge it wins. This means that calcium and magnesium (not to mention all the monovalent cations) are pushed off the exchange sites and are then slowly leached out of the soil. So, yes H+ in solution can compete for exchange sites, but they are never going to cover all the exchange sites, because no matter the pH they will be outcompeted by di- or tri-valent cations. What the H+ will do is actually bond (a different chemical process to the outer sphere attractions of the exchangable cations) with exchange sites reversing their charge. The good news is if you manage to get your soil down to pH 3 you’ll have reversed so many of your exchange sites that the soil will have a net positive charge and so be able to hold on to NO3- at last (yay!). Unfortunately you will have killed absolutely everything and be litterally dissolving your soil. There is also a lot of stupid gardening advise on the net as well. It seams to me every one out there tries to make it as complected as they can just to turn a dollar. Lay a layer of hay, straw, grass clippings, leaves and sticks and compost is all you need and water with the right ph. and that is all. We have some of the highest brix readings out there. All we do is keep adding mulch and that is all. We have laid garden beds over lawns and nothing else. With the same great results. We set up commercial gardens in Lebanon using this method on soil that would not grow weeds on, so we built the gardens on top of the ground and not the normal way. Digging the soil is perhaps the worst thing you can do. Greg. P.S. all these results have been documented and are at the department of Agriculture. Thanks for the info, Greg. Are those documented results online? If so, can you supply a link? Soil pH is a measurement of the concentration of hydrogen vs hydroxyl ions in a soil sample.. Having a low pH doesn’t necessarily cause a nutrient problem if all the nutrients are in the proper balance. Your soil could have the proper pH but still have a nutrient problem if the balance is out. A low pH is really only an issue if the plant growing there is sensitive to a certain nutrients, like geraniums and iron. The only way to know what your soil needs is a complete soil test showing nutrient charges and moisture retention properties. If I apply Dolomite Lime to my soil, how long will it take to increase my soil’s pH? Can I use husk ash instead of Dolomite Lime for my soil?